We can engrave and cut leather. This is a leather tag made for Erwin Penland. Laser cut invitations are very impressive. We have made them for individuals and small businesses. 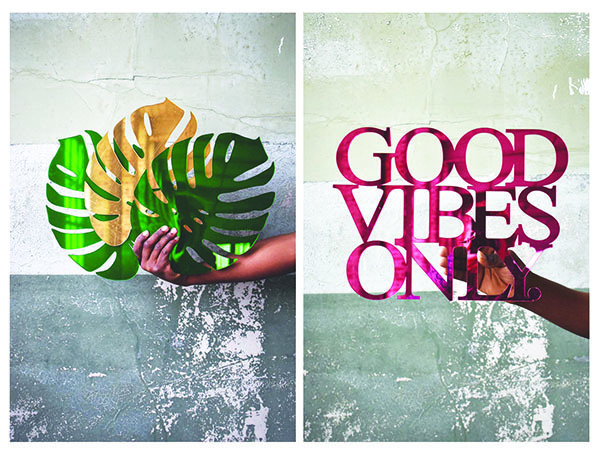 We can create a design for you, or you can give us your own design for us to laser cut. A wood coaster design we regularly make for 13 Stripes Brewery to sell at their Brewery and special events. Yes! We can laser engraved food! We engraved these pancakes for an IHop social media campaign. A gold mirror hashtag sign made for a school fundraiser. This sign stands upright on a table top. Fun acrylic good decals made for a customer (for pins, jewelry, etc). 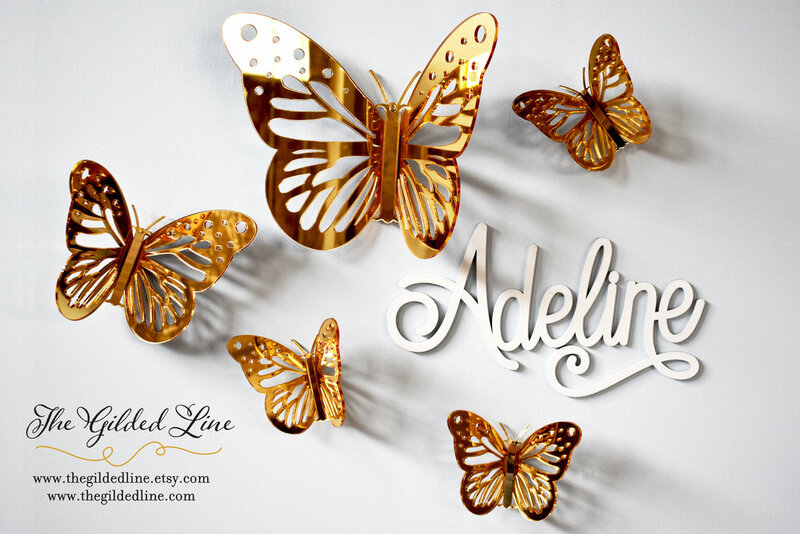 Gold mirror 3D butterflies and a custom name sign we sell under our brand, The Gilded Line. We designed, laser cut, and assembled an order of 500 pop up cards for Menard (rigging). Wood engraved ornaments made for Taylors Mill. A series of acrylic mirrored signs we made for a client in NYC. A wood veneer birthday invitation we designed and made for a private customer. We can make a laser cut wood model of your business or home! 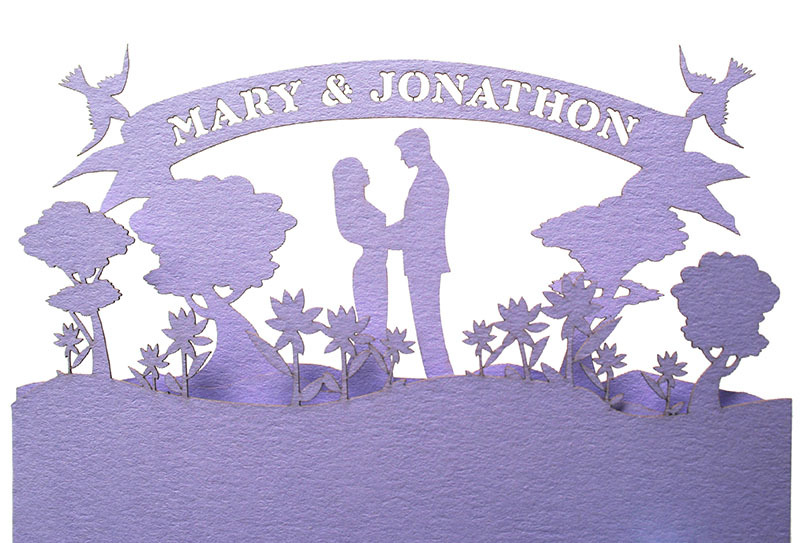 Detail of a custom laser cut wedding invitation we made for a wedding planner. Custom Christmas name ornaments we made and sell on our etsy website here. We make business cars out of unique materials, like flexible acrylic with an aluminum look (seen here). Studio suite numbers we made for each tenant’s space at The Taylors Mill, made from white and orange acrylic. We designed and made this Christmas card for Silva Construction Company, featuring a little house that pops out to be used as an ornament. The card is made from thin cherry wood veneer. Custom wood engraved coasters we made for a local business, IN THE KNOW.